Can better signage mean better business? Ask Tab Sims of the Motel 6 Marketing Department who reported: "Improved signage increased our business by over 38%." [From "Economic Value of On-Premise Signage, published by the University of San Diego Business School, 1997.] Tab simply raised an existing sign to make it more visible to motorists. Imagine the impact that you can make on your business by raising a full color, sign from InstantSign. Reinforce your property's image by displaying your corporate logos, colors and typestyles on all of your signage. Make a great drive-up impression with a colorful exterior directional sign. 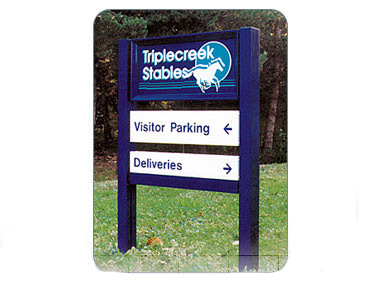 Directional signs promote your property's amenities and help guests find their way around. Exterior directional signs improve traffic flow by directing and informing customers. Inform your guests of pool and spa hours, as well as safety policies, with durable and attractive signage. Promote special events and welcome conventioneers and hotel guests with custom banners, table tents and easel signs. Protect your guests with professional, easy-to-read signs that help your property meet safety standards and comply with the Americans with Disabilities Act. By using InstantSign lettering and graphics on your courtesy vehicles, you'll build name awareness with multiple advertising impressions, mile after mile. Customized scheduling boards can help you track projects and housekeeping status. Banner programs improve occupancy throughout the year. To generate sales, advertise special rates and welcome large groups of guests, hang promotional banners. Studies have shown that people tend to ignore what has become familiar, but a fresh new look reawakens their interest.